Tonya Hoover is the Superintendent of the U.S. Fire Administration's National Fire Academy (NFA). She was named to this position in May 2017. As Superintendent, Tonya provides leadership for the NFA, which focuses on enhancing the ability of fire and emergency services and allied professionals to deal more effectively with fire and related emergencies. 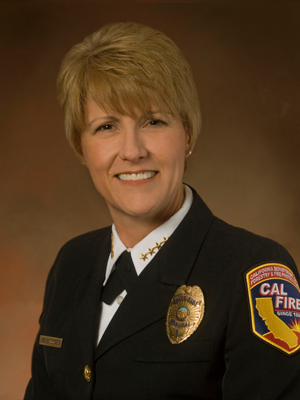 Prior to her position with the NFA, Tonya was the state fire marshal for the California Department of Forestry and Fire Protection and has been actively involved in fire prevention, public education, and risk mitigation for more than 20 years. Tonya graduated from Oklahoma State University with an Associate of Science Degree in Fire Protection Engineering Technology, a Bachelor of Science Degree in Technical Education specializing in fire protection engineering technology and safety. Tonya further earned a master's degree in business administration/human resources from the University of Phoenix. She holds several state fire marshal certifications, is a certified fire marshal, and holds a life-time teaching credential. Tonya serves as a member of several fire service associations and has received many awards and recognition for her work and dedication to the fire service including the 2014 William E. Fox Award for Outstanding Service and Leadership in the Fire Service. Tonya was first elected to the IFSTA Executive Board in July of 2015.